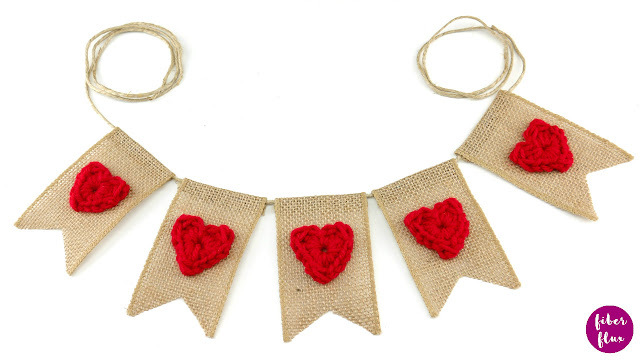 The Rustic Hearts Garland is a super cute, lightning fast, and easy as pie festive garland for Valentine's Made with sweet one round hearts, some burlap ribbon and twine, you can whip one up in no time flat! Make it as long as you like by simply adding more "flags" to the garland. Love this for a doorway, window, mantel, or over a mirror. Need a little extra help? 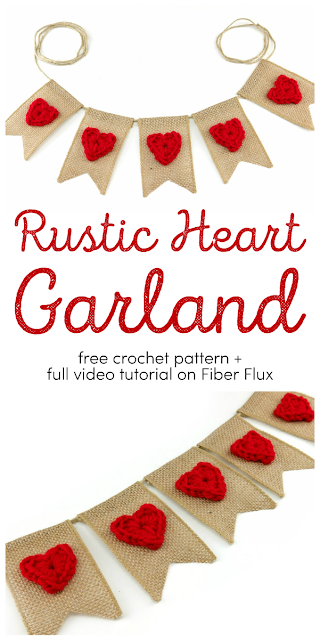 There's a full video tutorial too! Chain 4 and join with a slip stitch in the furthest ch from the hook to form a ring. Round 1 (work all stitches into the ring): dc, tr, dc, sl st, dc, tr, dc, sc, sc, sc, tr, sc, sc, sc, join to close heart with a slip stitch and fasten off. Weave in ends. Cut bottom points of the "flag" by locating the center the cutting two angles inward towards the center point. 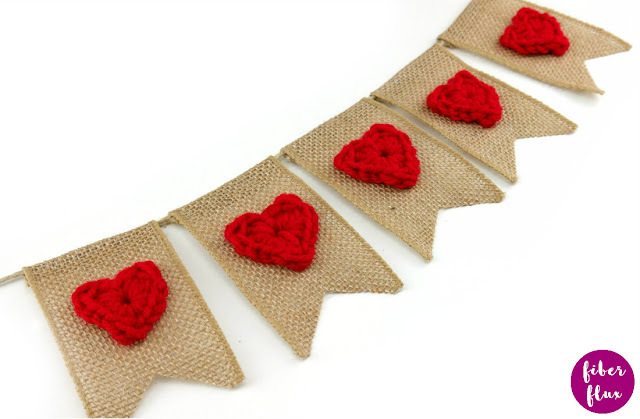 Lay the twine/ribbon/yarn flat and fold over the top edge of the burlap ribbon over it. Hot Glue in place. Flip garland over so flag seams are in the back, then glue a heart to the front center of each flag. Allow glue to completely cool and harden before use. Trim twine as needed for hanging.